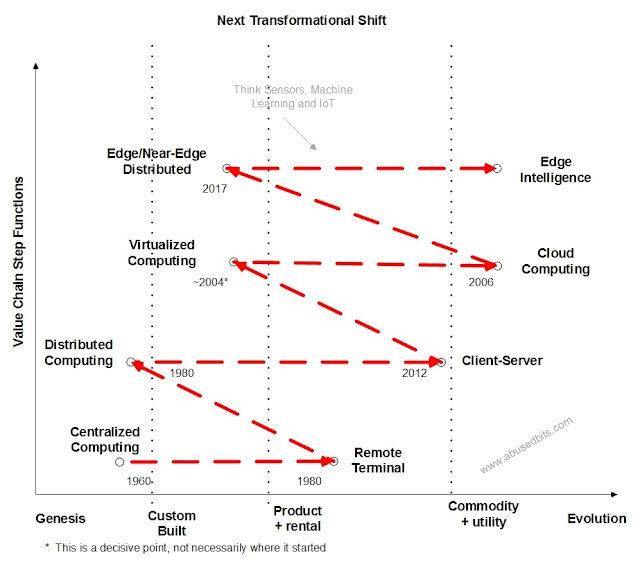 Historically, every massive Scale Up evokes a future Scale Out of capabilities in the IT industry. Centralized to distributed to centralized, etc. Inevitably, a technology advancement forces a state change in the mechanism or requirement that filters how the industry chooses to deal with that event. Today the industry is taking massive advantage of Cloud capabilities that are changing how computing services are acquired and managed. This advantage is, in no small part, arrived at by new commoditization levels of access to computing capability. It can be turned on and off at will and pay only for the portion of resource used. It is a Utility with respect to IDC's 3rd Platform concepts and equates directly to a financial disruption to the traditional model of application delivery. On the horizon, are things like IoT (Internet of Things, that have the potential to take significant advantage of new streams of data made available by sensors for, well, anything. When content delivery and IOT bandwidth and/or latency requirements overrun the data transport capabilities of the mega Data Center, two things based on the history of this industry are almost assured to change for the 3rd Platform Utility consumption of computing resource. The consequence of this may be instrumental in the next major change in the development of the Data Center industry. One possible model for this change is a hub and spoke model for compute resource consumption. In this model, the mega Data Center becomes the hub for the majority of bandwidth or latency insensitive applications and the spoke provides all of the edge services for bandwidth and latency sensitive requirements. The compute utility will have to assume a role that not only spans availability zones for application redundancy, but edge zones for the more sensitive application requirements. Where it could get really interesting, if the power utilities started to provide co-location (edge) services for mega Data Centers. The combination could be extremely compelling, especially if the power utility were able to achieve re-classification of the edge service data center as an IT resource rather than a typical power consumption entity (human facility). Consider the ramifications of a co-location hosting facility within the boundaries of an electrical substation. Re-classification of the edge service to an IT resource could eliminate much of the expense of power redundancy for the co-location facility, with minor modifications of the existing power delivery rules. It could be dual fed from two active power sources. As an example, a redundant power generation facility would not be required. As another example, a UPS would not be required. As a third example, a power transfer switch would not be required. Furthermore, it could provide an immediate step down to direct electrical bus in the IT resource facility. In the future, direct step from AC power to DC in the IT resource to get at the extra ~8% efficiency. Power distribution aligns pretty darn nice with edge service data distribution facilities. If the power Utility was worth its salt, it either has a fiber network already established OR it has partnered with someone to lay fiber in the right of way. This would place compute, subsequently creation and consumption, within milliseconds of the majority of the population and nearly all of the industries at fiber bandwidth.